Amidst the fall of snow and a swirling storm of parcels and letters, something dark and unwholesome lurks, waiting. So little time remains and not a chance for anyone to receive these valuable tomes, grimoires and books of esoteric guidance by mail. 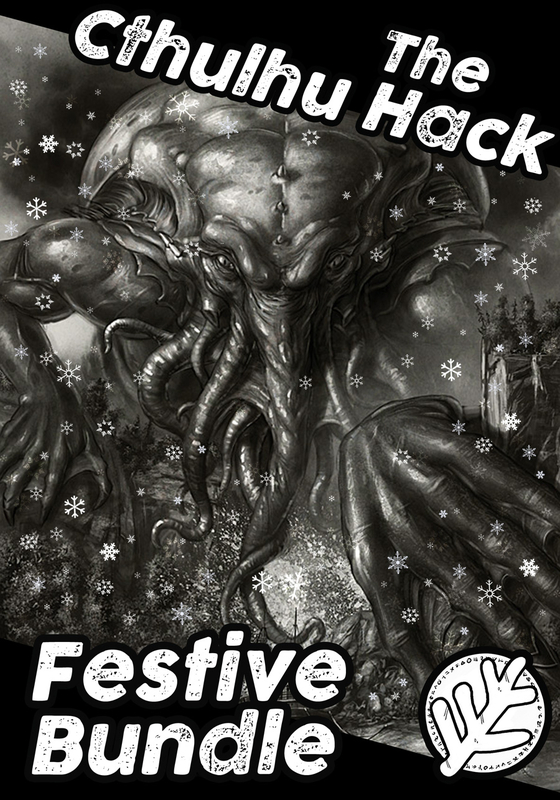 Here’s a chance to pick up the whole bundle of goodies from The Cthulhu Hack published in 2016 – either for yourself or gifted to a friend. When you Checkout, tick Buying for someone else? (low on the right) and you can enter someone else’s email address – passing the curse of the Elder Gods on to almost anyone! This special Festive Bundle product contains the following titles. With a total value of $14.86, RPGNow and DriveThru also deduct anything you might already have from the bundle. The full Festive Bundle is price: $11.89, which saves you 20% off the normal price ($2.97).